There’s really no use in hiding my secret any longer, I’m a chocoholic! Ok, so I guess if you follow me on social media then it’s really no big secret that I have a love affair with chocolate. My #chocolateaday hashtag on Instagram may have given that away! For the most part, my addiction to chocolate is very mild. I have my limits and I am good at moderating my chocolate intake. My husband actually laughs at me because I can make a full size Godiva bar last for 2 weeks by only eating one square a night. It’s just enough of an indulgence to cure my craving. I prefer dark chocolate because the rest of the family won’t touch it. I can keep it in the house longer that way. I really only eat chocolate at night, but if I’m having a rough day I’ll sneak a piece during the day. My mother was a chocoholic before me, I blame it all on her! She’s still a chocoholic and I have to hide my “good stuff” when she comes for a visit. Shhhh…..she reads my blog! I like my chocolate chilled in the fridge. We live in Florida, so if I left it out, it would likely melt. Chocolate is always better when it’s paired with caramel, sea salt, or peanut butter. However; pretzels, popcorn and potato chips are also good combinations. Chipotle + sea salt + dark chocolate is REALLY snappy!! I’m dying for another bite….but I’m all out!! Did you know that a recent study proved that chocolate can help improve your memory as you get older? You may have to eat as many as 7 full size chocolate bars a day before you get enough chocolate to make a difference though. Just one more reason why it’s ok to eat chocolate, right?? Did you know that October 28th is National Chocolate Day! I guess I should go replenish my supply of Chuao Chocolates for the celebration. I sure hope the Fresh Market by my house still have some in stock. Fusion chocolate? This is what Chef Michael Antonorsi calls the unusual and unexpected flavors that he pairs with premium chocolate and fresh natural ingredients. Chuao Chocolatier is the first Venezuelan chocolatier based in the US (Southern California). They create fun bite-sized chocolate pods, full-size chocolate bars, bonbons, and even drinking chocolate. Because I had no idea; Chuao is pronounced (chew-WOW) and they even mark it on some of their chocolates!! Thank you Chuao for sending me a sampling of your favorite chocolates. Now that I’m totally addicted I hope that our local retailer keeps it in stock for me. 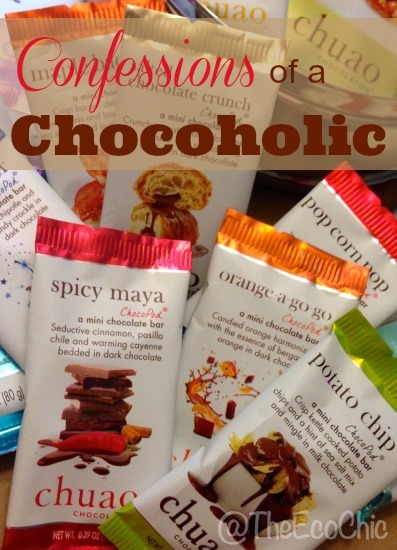 I was not paid to make these confessions; unless chocolate is now accepted at stores for payment. What’s in the May Ecocentric Mom Subscription Box? You know, chocolates tastes even better when shared. So, send some my way. JK.